Moog Industrial Group announced today that the company has been awarded a contract to supply a test system to Narec (National Renewable Energy Centre) to evaluate and test wind turbine blades at their new 100 m (328 ft) blade testing facility in Blyth, Northumberland, UK. Opening this summer, the independent facility will be utilized by manufacturers of turbine blades to test prototype blade designs and manufacturing processes. The new facility will accommodate blades being designed for larger offshore wind turbines up to 100 m (328 ft) in length and will complement Narec’s existing capability testing blades in the 50 m (164 ft) range. The new 100 m (328 ft) blade test facility will provide an independent and confidential environment to accelerate the development of new blade designs before they are taken offshore. It will be the largest facility of its type in the world and expands on Narec’s existing blade testing capability developed over the last five years, serving the global supply chain and industrial research communities. 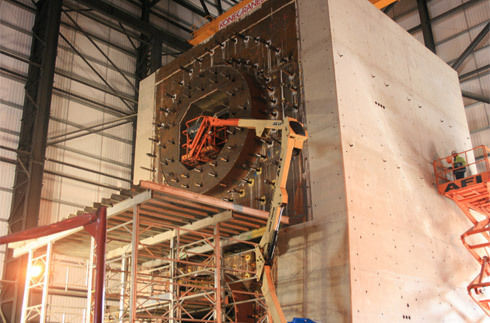 Moog will supply and commission a Test Controller and monitoring system to control the Narec Control Resonance Mass (CRM), which is used to excite natural frequencies in the blade structure and hence evaluate the blades resistance to fatigue under representative dynamic loading conditions. The scope of supply will also include a very high flow PLC controlled Hydraulic Power Unit designed to interface with the Narec primary control system. 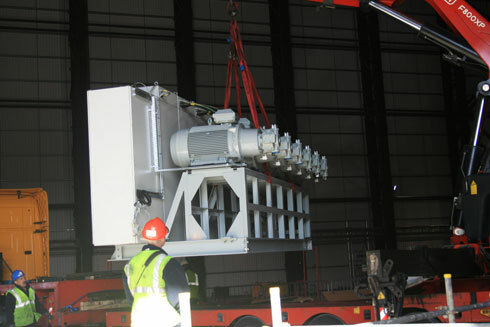 The power unit, comprising six Moog RKP Radial Piston Pumps, has an installed power of 675 kW, delivering a flow of 1,200 lpm (317 gpm US) at a pressure of 280 bar (4061 psi). A dedicated PLC controls and monitors the performance and health of the unit and a water cooling system maintains the temperature of the hydraulic fluid. 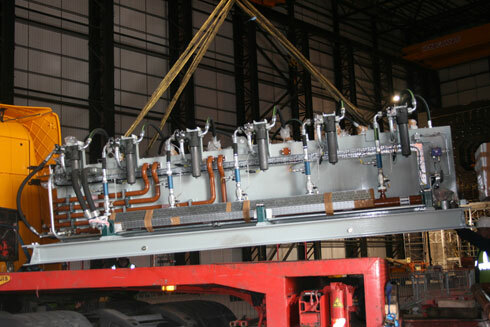 High pressure hydraulic fluid is circulated around the facility by a custom designed distribution network. Established in 2003, Narec is dedicated to advancing the development, demonstration and deployment of offshore renewable energy technologies - offshore renewable wind, wave and tidal energy generation. To date, it has invested over £150 million of UK government, private sector and European Union funding to create a unique portfolio of independent facilities in Blyth, Northumberland, England. The new world class facility is jointly funded by the Department for Business, Innovation and Skills, the Department for Energy and Climate Change (£11.5 m), Regional Development Agency One North East (£2 m) and the European Regional Development Fund (ERDF) managed by the Department for Communities and Local Government (£4.7 m).